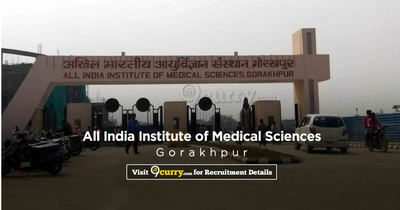 AIIMS Gorakhpur Recruitment 2019: All India Institute of Medical Sciences, Gorakhpur / www.aiimsjodhpur.edu.in is conducting recruitment processes to fill 54 vacancies. As of now, there are two recruitment drives going on for Apply Online for 43 Faculty Posts (Group A) and 11 Medical Supdt, Financial Advisor & Other Posts. AIIMS Gorakhpur Recruitment 2019 - Job notification for 11 Medical Supdt, Financial Advisor & Other Posts in AIIMS Gorakhpur, Gorakhpur, Haryana on Deputation Basis. Applications are invited by All India Institute of Medical Sciences, Gorakhpur on or before 07 May 2019 for 11 vacancies. AIIMS Gorakhpur Recruitment 2019 - Walk in for Non-Academics Junior Resident Post in AIIMS Gorakhpur, Gorakhpur, Uttar Pradesh on Contract Basis. Candidates are invited by All India Institute of Medical Sciences, Gorakhpur to attend walk-in-interview to be held on 28 Mar 2019 10:00 AM for 1 vacancy. AIIMS Gorakhpur Recruitment 2019 - Walk in for Sr. Resident Posts in AIIMS Gorakhpur, Gorakhpur, Uttar Pradesh. Candidates are invited by All India Institute of Medical Sciences, Gorakhpur to attend walk-in-interview to be held on 28 Mar 2019 12:00 PM for 4 vacancies.